Alexander Black and Tom Hanks in Tom Tykwer’s A HOLOGRAM FOR THE KING. ©Roadside Attractions. CR: Helmut Prein. HOLLYWOOD—In Tom Tykwer’s filmed adaptation of Dave Eggers’ novel “A Hologram for the King,” a desperate American businessman (played by two-time Oscar winner Tom Hanks) awaits a meeting with Saudi Arabia’s monarch in hopes of landing a lucrative contract to provide IT services for a massive construction project. Similar to the classic “Waiting for Godot,” Hanks’ Alan Clay is forced to cool his heels for days in the arid Middle Eastern country. The German filmmaker, known for his recent collaborations with Andy and Lana Wachowski (“Cloud Atlas,” the acclaimed TV series “Sense8”), says he could relate to the story, having spent a great deal of time in Hollywood, which requires a great deal of patience and perseverance while waiting for powerful people to make decisions. Tykwer, 50, had only one actor in mind when he read Eggers’ novel a few years ago: Tom Hanks. He pitched the idea of a film adaptation to the author, even before he had the Hollywood megastar onboard. With Eggers’ blessing, Tykwer then contacted Hanks, whom he previously directed in the sci-fi epic “Cloud Atlas.” Hanks was game, and soon they were off. (Tykwer and Eggers co-wrote the screenplay.) The film shot in multiple locations including Berlin, Morocco and Saudi Arabia. As New York businessman Alan Clay, Hanks plays a man desperate to land a big client for his company. However, he and his small local staff run into bureaucracy in meeting with the king, with whom he hopes to deliver a presentation involving a hologram. While waiting for his delayed appointment, Clay befriends Yousef, a local driver (a comical Alexander Black) and a beautiful physician named Dr. Hassan (played by British actress Sarita Choudhury), with whom he becomes romantically involved, despite local cultural taboos. Tykwer: It didn’t take that much time. Didn’t it take them two years to shoot that? Q: I think so. But you managed to complete your desert epic a lot faster. Q: It’s unusual to see Tom Hanks in a romantic role. Q: How did the project come about? Why did you want to adapt the book into a film? 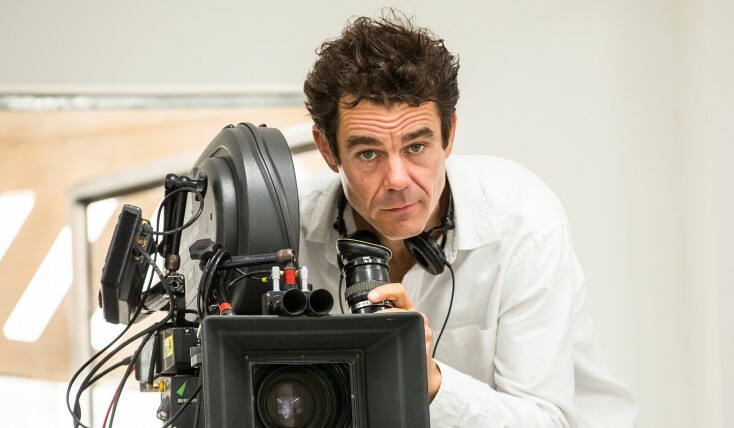 Tykwer: I read the book when it was really fresh, and just loved it. I felt I knew the way into the movie that would be different enough to be an adaptation and still protect the vision of the book. Just adapting a book is not something, in general, I think filmmakers should do; I feel you should find your own approach or your own take on it. I had an instinct about it and then I called Dave (Eggers) and said, “Look, I think I have an idea for the movie that is different enough from the book and yet still protects what’s important about it. And I have the perfect actor. He said, “OK. Who is it?” And I said, “It’s Tom (Hanks).” And he goes, “Wow, do you have Tom?” And I said, “No, but let me call him now that I know you’re not against it.” So I called Tom. He had just read the book or he had just picked it up. And he said, “What do you want to do?” And I said, “I think there’s a melancholic comedy hidden in here that I think we should focus on.” Within all the bleak and more dark aspects of the tale, the film should protect the lighter aspects of it, the lighter meaning there. The beauty of the comfort of the book is that it seems like a dead end for a guy. It seems there is no way out of his crisis. And then he learns how to connect with people and not just play his role, and do his usual businessman mark thing. Suddenly, there’s a way to reinvent himself even though he’s in his 50s and at the end of his rope. That was intriguing to both Tom (Hanks) and Dave (Eggers, the author). I said I wanted to focus on this kind of hope aspect. Q: You already knew Tom previously. Tykwer: Yes. We’d worked together on “Cloud Atlas.” I really enjoyed that. We didn’t get to spend too much time together because a big chunk of his stuff for that film was filmed by the Wachowskis and I took care of other things. So we were hoping to find something and then this one was. For me it was written all over the pages and all of that that it had to be Tom Hanks. I wouldn’t have done it without him. I wouldn’t have even tried to write a draft of the script without his interest. I think he really carries the weight of the movie on his shoulders. Completely. Q: The audience believes him as this desperate businessman. Tykwer: It also shows what a great team player he is because the movie rests on the relationship of his character with that of Alexander Black’s character (Yousef, the driver) and, of course, Sarita Choudhury’s character (Dr. Hassan). The chemistry between those characters with him is really what makes the movie work, in my opinion. Q: Part of this film is almost like a buddy comedy with Alan’s antics with his driver. Tykwer: Yes. And then it’s a romance (with Choudhury). Tykwer: (Chuckling) And it’s just 90 minutes. Q: Did you film in the kingdom of Saudi Arabia? Tykwer: We did. We couldn’t take the actors there but we shot the exteriors there, the wide shots, and Mecca, of course and the shots of (the city of) Jeddah. That’s all real. That’s all Saudi Arabia. We went into the scenes with the actors we went to the Western Sahara. It’s still the Sahara, but it’s the very western portion of it. It’s in Morocco. It’s kind of the end of the planet because there’s no infrastructure. There’s never been a film set there. We had to bring everything (with us). There were no hotels. We had to improvise a lot. Luckily and wonderfully, everybody was cool with that. There was one hotel where we could only take cold showers and one hot shower. Q: You’ve filmed in out remote places, so you’re used to coping with sometimes Spartan conditions, right? And adapting to another culture is part of the story. Tykwer: Yeah. I made that trip myself that Alan Clay does to Saudi Arabia. It basically was mimicking what Dave Eggers did in the research for his novel. So I sort of knew anything we were showing was real and possible and not just an idealized version of how complicated a country it is. It is a complicated country but it has a lot of beautiful people. Q: The last I heard, they don’t allow cinemas there. Do they have them now? Tykwer: No, they don’t. They watch TV and that’s it. Q: Do you think this film may be seen there at some point? Tykwer: I think probably piracy there starts (April 22, the worldwide release date). I have to live with that and I’m fine (with it). I’m sure the entire country wants to watch this movie, legally or illegally. It’s a very developed place. There’s a big middle class, and they want to watch stuff. So, I get it. The world is digital and the world is online. It’s really hard to not have people watch something when they really want to watch it. Q: The story is about this man waiting and waiting and waiting to meet with the king. You’re in show business, so I assume you’ve had a similar experience. What can you share? Tykwer: Making every single movie is like this. For me, it’s a big metaphor for filmmaking. We believe we have the best idea on the planet and then we go somewhere and have to look like those believers. And then we wait for financiers or sometimes for actors or for all of these elements to come together. I know so many people who’ve spent years of their life in Los Angeles, sitting in lobbies or pool areas of hotels or hallways hotels or agencies or any kind of place where you might meet someone who might know someone who might know someone who might have some money. That’s the film business. The film business is waiting for the king. Tykwer: I am but only briefly because I’m working on my own project, which is a TV show called “Babylon Berlin.” (Volker Bruch of “Generation War” and Liv Lisa Fries, “She Deserved It” lead the cast.) That’s a German TV show I’m starting to film in three weeks. We’re doing 16 episodes until Christmas. It’s a big, really exciting thing set in 1929 in Weimer Republic in Berlin. It’s going to be a thriller and a cop movie. It’s going into the nightlife and the cabaret and everything in Berlin in the ‘20s. So it’s a really exciting project that will take up most of my time this year. But for “Sense8”, I will be filming in Nairobi. It also was my connection in the first season. I worked there and in Berlin in the first season. This time, I’m going to do the Nairobi part, my African part. This is the connection I’ve had through my wife (Marie Steinmann). She runs an NGO there, so I’m quite familiar with Kenya.